Marriott’s W Escape brand expands into the Middle East with its first property in Dubai. The newest W Escape hotel has opened in Dubai, UAE, with 292 guest rooms and 58 suites, each with a balcony and water views. The W Dubai - The Palm is situated on a private beach on the west crescent of the world’s largest artificial island, the Palm Jumeirah, close to the recently opened Emerald Palace Kempinski Dubai. The property has a total of 16,038 square feet of meeting space across six event rooms. Two "strategy rooms" range from 323 to 484 square feet each, and there are three studios, the largest of which can host 60 for a presentation and has prefunction space with an adjacent outdoor terrace. The 13,078-square-foot Great Room is oval shaped and designed with rotating walls to adjust the amount of natural light that's desired at different times. It can host up to 800 for a conference and 600 for a banquet. There are six dining outlets, including two signature restaurants overseen by Michelin starred chefs: Torno Subito is Massimo Bottura’s only restaurant outside Italy, and Akira Back celebrates modern Japanese cuisine in his eponymous restaurant with indoor and outdoor dining. 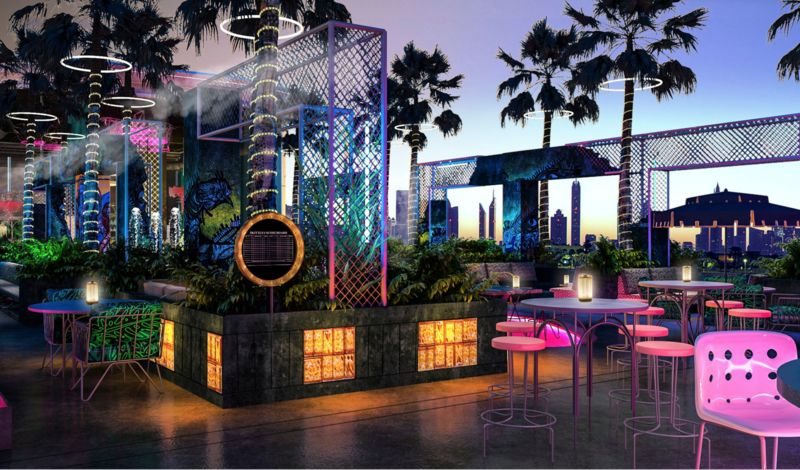 The W Dubai is also home to the Latin American-themed Sobe, the only rooftop bar on the Palm Jumeirah. The venue is open for dinner and boasts 360-degree views of the Arabian Ocean and Dubai Marina skyline. Other amenities include multiple swimming pools, a fitness studio, and an Away Spa with 11 treatment rooms. The W Dubai - The Palm is 15 miles from Al Maktoum International Airport and 18 miles from Dubai International Airport.